When I first read Nurse Alma Clarke’s English-language scrapbook of her WWI experiences, I struggled to envision her photos, drawings, and notes as a digital project. The content seemed to lend itself to an essay on cultural history, not a map, timeline, or other digital item. As I kept reading, though, I discovered pages of soldiers’ names. Most of the soldiers were American, but a few of them were French and one was British. Alma perserved their names, hometowns, injuries, major battles, and medals in tables that she drew longhand in pencil. I realized that Alma included enough data in her inventory of patients to pinpoint the soldiers’ journeys on a map. Suddenly, I had a project. I would visualize the arc of the soldiers’ travels, from their hometowns to the frontlines and finally to Alma’s Red Cross American Military Hospital, No. 1, housed in the Lycée Pasteur academy in Neuilly-sur-Seine, France. Arguably the hardest part of the project was transcribing the inventory. The scrapbook has been digitized, but since the scrapbook’s text is handwritten, not typed, OCR software will not transcribe the document. As such, I had to retype every page and arrange the data in a chart that emulated the scrapbook’s layout. In the process, I learned that the data was less cooperative than I had hoped. Some entries had no hometown address, or even a hometown, in a few cases. Other entries omitted the names of battles or summaries of the wounds that soldiers received. One man’s name on page BMC_010r was struck through and illegible. Information from one entry might spill into another part of the chart, as was the case with the illegible name on BMC­_010r, or with Herbert Martin & Grady Salter’s entries on BMC_028r. The data posed problems of greater significance. First, the entries were not written in one hand, as I had initially thought. I now believe that Alma asked the patients, and perhaps other nurses or orderlies, to fill out the ledger. These individuals wrote with varying levels of neatness and grammatical accuracy. We cannot know for sure who authored each entry. I ran searches for some of the trickier soldier names on Ancestry.com, but a few names remained illusive, so I had to make educated guesses when transcribing them. Such was the case with the French soldier Leo Tasquet (hopefully that is his correct name) on BMC_028r. A secondary problem arose: Several entries, including Leo’s, were in French. I cannot read French, so I asked around for assistance. Ultimately, an undergraduate from Villanova’s Romance Languages Department helped me to transcribe and translate these entries. Merci, Alice! No documentary editing project happens in solitude. The third issue with the scrapbook was the omission of key dates. When I first skimmed through the book, I assumed that every battle would be matched with the date a patient fought in it. However, when I read the scrapbook in its entirety, I learned this was not the case. Similarly, the inventory did not always say on which day, or even in which battle, the patients were injured. The last battle a soldier mentioned was not necessarily the place he received his wound(s). My initial plan for visualizing the data had been to create an animated map — as you scrolled past a date, a new marker would appear — but I realized this plan would have to be discarded. You cannot show change over time effectively if half (or more) of your events have no date! As such, my final project is a stationary map. I provide the dates of battles in the captions where applicable. The map may not be the most fancy from a digital perspective, but all the available data is there. The fourth complication with the data was finding latitude and longitude coordinates for the places each man fought. Places like “Saint-Mihiel” or “Wissous” were easy to identify, as they are specific towns. Unfortunately, “Argonne Forest,” “Somme,” and “Champagne” refer to battles that spanned dozens of miles, with swaths of the countryside torn apart. If I had a lot of time and access to the National Archives’ holdings on the U.S. military, I could probably find each regiment, track it through the battlefield, and write down the sequence of GPS coordinates. However, that process would take weeks, if not months. The scale of this project was greater than the time left in the semester. I compromised by identifying sites at the center of major battlefields. Even though I failed to locate every troop position, I believe that my map provides a general sense of where the soldiers traveled. 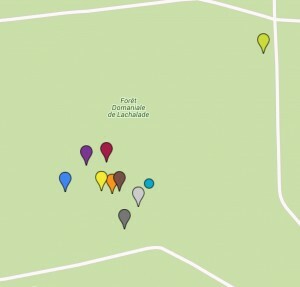 In some ways, my map is an artistic impression of the soldiers’ movements, rather than a strictly historical account. I know that Alma’s patients began their journeys in America and ended them in the Lycée Pasteur; where they went in between those locations remains hazy. Still, the artistic fiction of my map sits atop a base of historical research, which I have embedded on this page and made available to download. Some cartographic issues popped up near the end of the project. Google Maps only shows one marker per set of latitude/longitude coordinates. In other words, if every soldier in a particular battle had the same coordinates, then only one point would appear on the map, and this would not convey the volume of individuals in each zone. As such, I gave the soldiers who fought in Champagne or the Argonne Forest coordinates that were very similar, but different by a few decimal points. Again, there was an element of historical fiction to this process. I also gave each soldier a distinct color and/or shape for his map markers, so that his narrative could be followed easily across the map. What does my project reveal? Above all else, Alma’s inventory illuminates the spatial dynamics of WWI. Alma’s patients hailed from towns all over the United States, as well as France and Britain, but military service funneled these soldiers into the same places. Look through the transcribed inventory. 32 men fought in or near the Argonne Forest. 23 men fought on or near the Champagne front. 13 fought at Verdun. And so on. Shared battle experiences united Americans from diverse geographic origins, not to mention diverse economic, racial, and ethnic backgrounds. Those combat experiences also forced Americans to interact with French and British soldiers from the broader alliance. My map visualizes only a sample of the patients, but the markers clustered in Champagne and Argonne make this unifying spatial dynamic clear. The war blurred not only class, nationality, and social status, but also the physical spaces that men occupied. 10 of Alma’s 32 patients who fought in the Argonne Forest. From “The Long Road” Map by Daniel Gorman Jr., based on Alma Clarke’s patient inventory. Reading the inventory hammers home the casualties of WWI. It is one thing to read that thousands of men died or were wounded at Verdun, but it is another to read their individual names and injuries. By preserving portraits of her patients, Alma humanized the war’s cold statistics. At the same time, Alma’s inventory only encompasses men from Ward 185 of the Lycée Pasteur. That’s just one ward of just one hospital, amid a vast theatre of war. The scale of the casualties is appalling. “Give my gratitude to Mademoiselle Clarke for the good care.” — René Bausc (French). “If you want to know the auxiliary in No. 1 ^hospital,^ it’s Miss Clarke of New York. She was more than to willing to do anything in her power for every one of the boys, and personally I can’t thank her enough for the many things she’ done for me.” — Elmer Ohlson (American). “Cared for in the American Ambulance, Neuilly, by Miss Clarke, the nice and dedicated nurse, to whom I give my sincerest thanks for the good care that she gave me.” — Antoine Descombes (French). “Thanks to the care of Miss Clarke in ward 185, – I am still going strong and nearly ready for another scrap.” — Clarence T. Barnes (American). The logical way to expand this study is to find more GPS coordinates for each regiment and produce an expanded map. Next, historians should determine which of the patients, if any, died in the hospital — something Alma never recorded. Websites like Ancestry.com and Fold3 supply enough census data for historians to conduct this kind of research. Finally, historians could investigate soldiers’ long-term health struggles after returning home. Many soldiers had abstracts of their service, which outlined their experiences and medical issues. Ancestry.com has digitized a significant number of these abstracts, but the full collection is available only at the National Archives. These projects would be lengthy, but they would provide a full portrait of the journeys that American soldiers undertook, even after WWI came to an end. Thank you, David Uspal and Laura Bang at Falvey Library; Prof. Deb Boyer; Alice Zylla, B.A. ’16, for helping with the French passages; Dr. Seth Whidden, Romance Languages Department; and my dad, Lt. Col. Daniel Gorman, for teaching me to read military maps. “2nd Battle of the Marne: Soissons and Vicinity, Franco-American Counterattack, 18 July–6 August 1918.” Dept. of Military Art and Engineering, West Point Military Academy. Wikimedia Commons. File in the Public Domain. File uploaded by Lawrencema [pseud. ], modified by Hohum [pseud.]. Last modified January 11, 2012. Accessed November 26, 2015. https://commons.wikimedia.org/wiki/File:2ndBattleOfTheMarne.jpg. “Argonne Forest (PSF).” Archives of Pearson Scott Foresman [publisher]. Wikimedia Commons. Image in the Public Domain. Last modified February 18, 2008. Accessed November 27, 2015. https://commons.wikimedia.org/wiki/File:Argonne_Forest_(PSF).png. “Battles of French Flanders & Artois, France.” The Great War 1914–1918. Accessed November 29, 2015. http://www.greatwar.co.uk/battles/french-flanders-artois/battles-french-flanders-artois.htm. “Battle of Seicheprey, April 20, 1918, US 26th Infantry Division.” American Expeditionary Force: Doughboys in WWI. Accessed November 28, 2015. http://www.usaww1.com/American-Expeditionary-Force/American-Expeditionary-Force-Battle-of-Seicheprey.php4. “Battles of the Western Front.” The Great War, 1914–1918. Accessed November 29, 2015. http://www.greatwar.co.uk/battles/. “Chemins des Dames.” First World War [website]. Accessed November 27, 2015. “The Chemins des Dames Battlefield [Google map].” Google Maps. Accessed November 27, 2015. Clarke, Alma A.“Alma Clarke’s English WWI Scrapbook.” Ca. 1927 (covering events from ca. 1910–1920). Alma A. Clarke Papers, Bryn Mawr College Special Collections. Accessed November 2015. http://triptych.brynmawr.edu/cdm/ref/collection/almaclarke/id/178. “Collier’s 1921 World War – Maps.” Wikimedia Commons. Files in the Public Domain. Files uploaded by Bob Burkhardt. Accessed November 25–27, 2015. https://commons.wikimedia.org/wiki/Category:Collier%27s_1921_World_War_-_maps. Duffy, Michael. “Battles – The Second Battle of the Marne, 1918.” First World War.com: A Multimedia History of World War One. Last modified August 22, 2009. Accessed November 25, 2015. http://www.firstworldwar.com/battles/marne2.htm. “French Flanders and Artois Battlefields of WW1, France.” The Great War 1914–1918. Accessed November 29, 2015. http://www.greatwar.co.uk/french-flanders-artois/french-flanders-artois-index.htm. 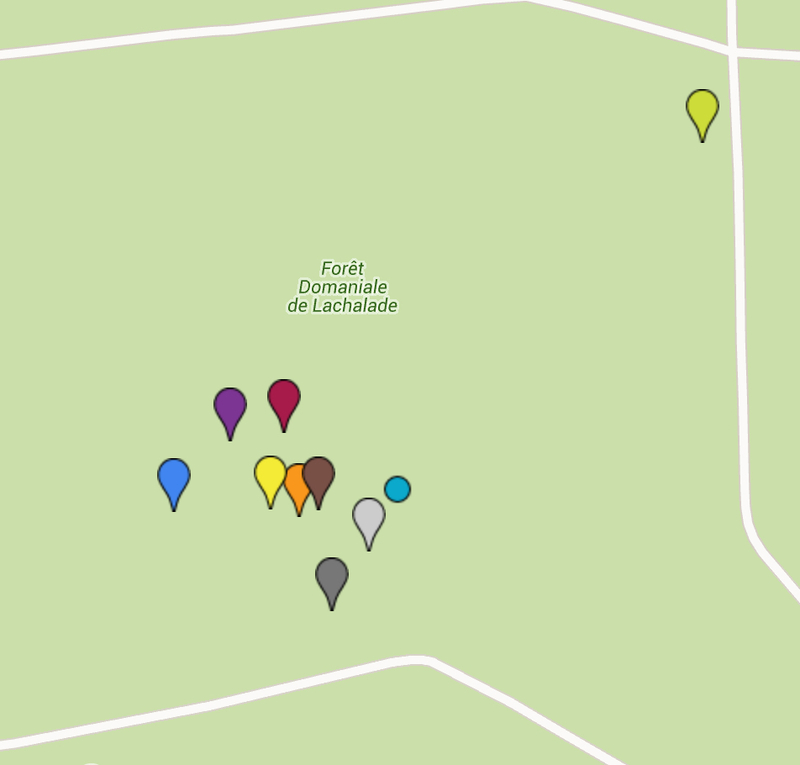 “GeoHack – Battle of Mulhouse.” Wikimedia Tool Labs. Accessed November 29, 2015. “GeoHack – Battle of Vimy Ridge.” Wikimedia Tool Labs. Accessed November 29, 2015. “GeoHack – First Battle of Artois.” Wikimedia Tool Labs. Accessed November 29, 2015. “GeoHack – Second Battle of Artois.” Wikimedia Tool Labs. Accessed November 29, 2015. Gobeth, Wally. “Washington, DC: Colorado Building.” Photograph, October 31, 2010. Flickr. CC BY-NC-ND 2.0. Accessed November 25, 2015. https://www.flickr.com/photos/wallyg/5191414681. Highsmith, Carol M. “Architectural details on the Colorado Building, 14 and G. Street, NW, Washington, D.C.” Library of Congress Prints & Photographs Online Catalog, 2010. Accessed November 27, 2015. http://www.loc.gov/pictures/item/2010641340/. Johnson, Douglas Wilson. “Topographical map of the Villers Bretonneux Area [Reference for Second Battle of the Somme (1918)].” Originally published by New York: Henry Holt, 1917. Wikimedia Commons. File in the Public Domain. Uploaded by Keith-264 [pseud.]. File uploaded November 19, 2013. Accessed November 25, 2015. https://commons.wikimedia.org/wiki/Category:Second_Battle_of_the_Somme_(1918)#/media/File:Topography,_Villers_Bretonneux.jpg. A Little Guide to AFS in Paris: “Chapter Three: Neuilly-sur-Seine.” Our Story: The Field Service. Accessed November 23, 2015. http://www.ourstory.info/library/Paris/ParisAFS3.html. “Map Showing the battle lines for the American drive at St. Mihiel from September 12–17, 1918.” Collier’s New Encyclopedia, vol. 10 (P.F. Collier, 1921), 431. Wikimedia Commons. File in the Public Domain. File uploaded by Bob Burkhardt. Accessed November 27, 2015. “Map of the Battle of the Somme, 1916.” Wikimedia Commons. CC BY-SA 3.0. File uploaded by Grandiose [pseud.]. File uploaded July 3, 2013. Accessed November 29, 2015. https://commons.wikimedia.org/wiki/File:Map_of_the_Battle_of_the_Somme,_1916.svg. “Map of the Battle of St. Mihiel.” Wikimedia Commons. CC BY-SA 3.0. File uploaded by Rcbutcher [pseud.]. Accessed November 27, 2015. “Our History: The History of the American Hospital of Paris.” American Hospital of Paris. Accessed November 23, 2015. https://www.american-hospital.org/en/american-hospital-of-paris/about-us/our-history.html. Quintiliano, Barbara. “An Auxiliary Nurse’s Scrapbooks of the Great War.” Home Before the Leaves Fall: The Great War, 1914–1918. Villanova University Special Collections and Digital Library. Last modified October 23, 2014. Accessed November 23, 2015. Rickard, J. “First battle of Artois, 27 September – 10 October 1914.” History of War.org, September 15, 2007. Accessed November 29, 2015. http://www.historyofwar.org/articles/battles_artoisI.html. “Vimy Ridge.” World War One Battlefields. Last modified 2008. Accessed November 28, 2015. For more about Red Cross American Military Hospital, No. 1, Lycée Pasteur, Neuilly-sur-Seine, see: Barbara Quintiliano, “An Auxiliary Nurse’s Scrapbooks of the Great War,” Home Before the Leaves Fall: The Great War, 1914–1918, Villanova University Special Collections and Digital Library, last modified October 23, 2014, accessed November 23, 2015, http://wwionline.org/articles/auxiliary-nurses-scrapbooks-great-war/; A Little Guide to AFS in Paris, “Chapter Three: Neuilly-sur-Seine,” Our Story: The Field Service, accessed November 23, 2015, http://www.ourstory.info/library/Paris/ParisAFS3.html; “Our History: The History of the American Hospital of Paris,” American Hospital of Paris, accessed November 23, 2015, https://www.american-hospital.org/en/american-hospital-of-paris/about-us/our-history.html. Alma A. Clarke, “Alma Clarke’s English WWI Scrapbook,” ca. 1927 (covering events from ca. 1910–1920), Alma A. Clarke Papers, Bryn Mawr College Special Collections, accessed November 2015, http://triptych.brynmawr.edu/cdm/ref/collection/almaclarke/id/178.